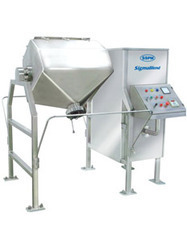 We are a leading Manufacturer of v blender, bin blender, lab / pilot scale blender, conta blender, ribbon mixers and ribbon blender from Ahmedabad, India. Leveraging on our technically advanced manufacturing techniques, we have been able to come up with advanced V Blender. These products are engineered in compliance with the international industry standards making use of premium grade metals and components. Furthermore, for ensuring timely delivery of ordered products, we have developed wide distribution channel across the globe. 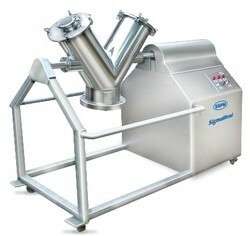 Our organization is listed at the apex amidst leading manufacturers, suppliers and exporters of Bin Blender. The blender we offer is designed and engineered under the keen supervision of experts who possess in depth understanding of this domain. Made utilizing advanced techniques and premium quality materials, these products possess no better alternative in the market. 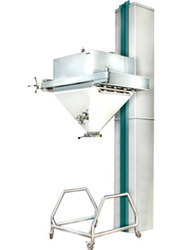 IBC Bin with trolley in Vacuum Rated Design. Leveraging on our technically advanced manufacturing techniques, we have been able to come up with advanced Lab Blender. These products are engineered in compliance with the international industry standards making use of premium grade metals and components. Furthermore, for ensuring timely delivery of ordered products, we have developed wide distribution channel across the globe. Leveraging on our technically advanced manufacturing techniques, we have been able to come up with advanced Ribbon Blender. These products are engineered in compliance with the international industry standards making use of premium grade metals and components. Furthermore, for ensuring timely delivery of ordered products, we have developed wide distribution channel across the globe. 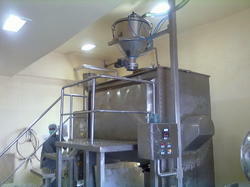 ü Blending is the natural form is the combining of two or more materials to produce a homogeneous mixing. ü These materials will be combination of particular solids particles. ü Normally blending of free flowing materials provides a gentle mixing action. ü Significant to any blending operation is the quality of the blend, i.e., batch variations. Different applications have varying requirements for product consistency. ü SSPM Conta Blender is with vacuum rated design hence you may load the material with the help of Pneumatic Conveying System. 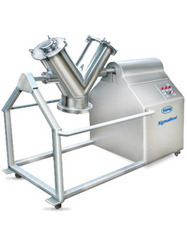 ü SSPM Co Mill is also in vacuum rated design so you can also load the blender with inline milling process with help of Pneumatic Conveying System. 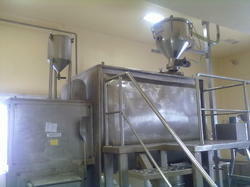 Ever since foundation stone of our firm has been laid down, we have been manufacturing, supplying and exporting V Blender. This type of blender is blending equipment which is suitable for mixing dry granules for dry powders and tablets in capsules homogeneously. Fixed with two different frames, this blender features a manually operated butter fly valve at the bottom. Ever since foundation stone of our firm has been laid down, we have been manufacturing, supplying and exporting Octagonal Blender. 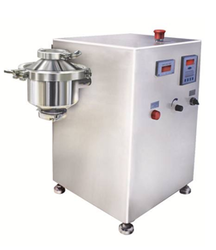 This type of blender is blending equipment which is suitable for mixing dry granules for dry powders and tablets in capsules homogenously. Fixed with two different frames, this blender features a manually operated butter fly valve at the bottom. Looking for BLENDER MACHINE ?